YOU will be spoilt for choice with the many restaurants, cafes, bistros and bars available in Desa Sri Hartamas, Kuala Lumpur. However, if you are bored of dining at the same places, look no further as there is a new restaurant called Willow Tree tucked away in a corner of this popular commercial area. Willow Tree’s Moroccan-raised head chef Elhadi El-Bouchaibi welcomes food lovers to try out his Western and Mediterranean cuisine at the restaurant that opened in December. “It’s all about doing something from the heart and for me, simplicity plays a big role. “I am still learning every day. 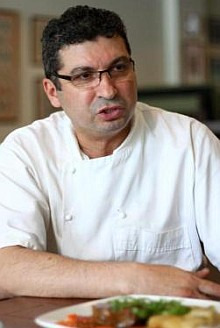 In order to improve, I am open to critism,” said Elhadi, who began his culinary career in London. Experienced : Elhadi has 25 years of experience in the industry. For starters, Elhadi prepared a Chicken Liver Parfait. Although, chicken liver has never been kind to my palate, Elhadi said the dish is one of the restaurant’s best-sellers. It is served with tomato onion chutney, mixed leaf salad and home baked bread. The tomato onion chutney was very pleasant, as it had a tinge of mustard and vinegar, giving it its well-deserved flavour. Flavourful: The New Zealand Leg of Lamb stuffed with mushrooms and sun dried tomato. Those who love chicken liver will enjoy Elhadi’s creation as, according to photographer Raymond Ooi, the dish was delicious. To accompany this, his well-trained staff brought in a basket of cheese bread served with home-made butter and a mixture of olive oil and balsamic vinegar. Although the bread looked hard at first sight, it was simply soft when we tore into it. The following dish was Elhadi’s special — Aubergine Caviar served with home-baked bruschetta. It would have been nice to see some colour on the Aubergine Caviar, but aubergine tends to lose colour when cooked. This dish is light and appropriate for those on a diet. Under the salad category, the friendly chef prepared King Prawn Salad with Willow Tree’s Marie Rose Sauce. This dish was exquisitely presented with fresh green salad, including mizuna, chlorella and green spinach, but the exciting part of the dish was the freshly cooked prawns. 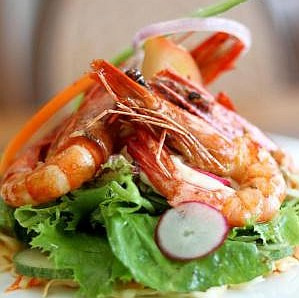 Tasty: Fresh prawns crown the salad. The prawns were not over-cooked and still tender, leaving you yearning for more. The main course was the Grilled Stuffed Chicken Breast with Mushroom Ragout served with cheesy mashed potato and mushroom sauce. Yes, this dish offered a very rich impression to first-time diners, but it was well worth tryng. Elhadi purposely uses chicken breast for this and the combination of mashed potato and mushroom sauce just gives the dish an added “umph”. The following main course was the New Zealand Leg of Lamb stuffed with mushrooms and sun dried tomato, served with dauphinoise potatoes. According to Elhadi, dauphinoise means thinly sliced potatoes which are baked and typically layered with cream, butter and cheese. What was nice about this dish was the meat, which was also served with French beans and thinly-sliced carrots with rosemary sauce. Dessert is a much anticipated item for most diners, and we were amazed with Elhadi’s speciality — Hadi’s Gateau. With sponge cake set as the base, this dessert has three layers of chocolate filling. 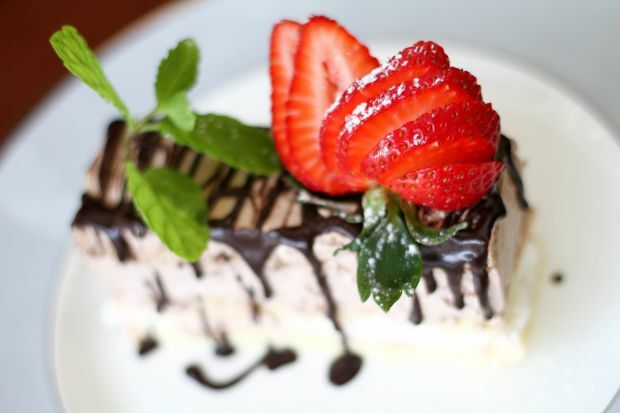 Toppped with mint leaves and sliced strawberry, this item is not to be missed. Ooi and I found this dessert absolutely pleasing and not rich. Another must-have was the Stilton Pannacota and Hammered Ice-Cream, which was Elhadi’s own creation. As I was about wrap up my interview, I noticed yet another dessert on the board — Hadi’s Vanilla Creme Brulee. This is a hot item among adults and children alike, which explains why it is sold out every day. Although, it was my first time having a Vanille Creme Brulee, I would truly recommend this dessert. Hats off to 46-year-old Elhadi, as he seriously puts his heart and soul into every dish he prepares. Cocktails, wine, liquor and beer are also available at Willow Tree. 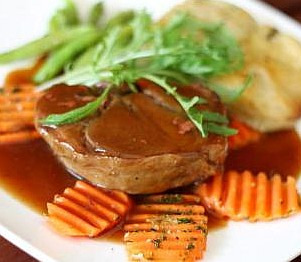 In addition to this, the restaurant also caters for private functions, parties and weddings.